In Exodus 14, the children of Israel are caught between a rock and a hard place. After a miraculous exodus from slavery in Egypt, they find themselves being pursued by Pharaoh’s army. If that is not bad enough, they are headed right toward the shores of the Red Sea, without a bridge or a boat to get across. Without a miracle, they will either be killed by the Egyptian army, taken back into slavery in Egypt, or drowned in the Red Sea. The situation looks very bleak. By most estimations, the number of people – men, women, and children – totaled about 2 million people. Their leader, Moses, stands before the people to offer encouragement. He tells them to not be afraid, to STAND and see the Lord’s salvation, to be quiet (read: stop complaining!!) and watch what God does. 5 When the king of Egypt was told that the people had fled, Pharaoh and his officials changed their minds about the people and said: “What have we done? We have released Israel from serving us.” 6 So he got his chariot ready and took his troops with him; 7 he took 600 of the best chariots and all the rest of the chariots of Egypt, with officers in each one. 8 The Lord hardened the heart of Pharaoh king of Egypt, and he pursued the Israelites, who were going out triumphantly. 9 The Egyptians—all Pharaoh’s horses and chariots, his horsemen, and his army—chased after them and caught up with them as they camped by the sea beside Pi-hahiroth, in front of Baal-zephon. The plight of the Israelites at the edge of the Red Sea is no different than our spiritual battles today. Sometimes we are caught between a rock and a hard place. We are faced with temptations all around us, with spiritual forces like guilt, fear, anxiety, and depression pressing down on us. Let’s see what the Israelites do, and learn from their example. Let’s use the word STAND as an acrostic to help us remember how to stand firm and see the Lord’s salvation. As a follower of Christ, we are more than conquerors through Christ (Romans 8:35-39). In other words, with the power of Christ living in you, you can be victorious over temptation every single time! 1. See that God is bigger than the obstacle. To the Israelites, Pharaoh’s army seemed unconquerable and the Red Sea seemed insurmountable. But compared to God, Pharaoh’s army was not powerful at all, and the Red Sea was easy to cross. The first thing the Israelites needed to do was to overcome their fear by seeing how big God was. We need to do the same. When we see how big God is, we will realize that He can save us from even the most difficult situations and put us right where He wants us to be. How can you see how big God is? 2. Trust God for the power to stand. If the Israelites had tried to form an army, they would have been defeated. If they had attempted to build boats or swim across the Red Sea, they would have surely drowned. The only way to be saved was to trust in God. And that’s just what they did. They did things God’s way. And that’s exactly what we need to do. When God placed a wall of fire between the Egyptians and the Israelites, they didn’t cross it. They broke camp, Moses raised up his walking stick as the LORD directed him, and the people prepared to cross the Red Sea. 19 Then the Angel of God, who was going in front of the Israelite forces, moved and went behind them. The pillar of cloud moved from in front of them and stood behind them. 20 It came between the Egyptian and Israelite forces. The cloud was there ⌊in⌋ the darkness, yet it lit up the night. So neither group came near the other all night long. How can you demonstrate your trust in God? 3. Always be completely obedient. The LORD directed Moses to raise his walking stick (staff) all night long. The LORD parted the Red Sea, making a dry path across to the other side. The people’s job? Simply walk across. It may seem to be an easy job to do, but what if the wall of water on the left or the right collapsed on them when they were in the middle of the sea? It took faith and obedience to get across. God saved them on that day. But their role was to walk in obedience. This story reminds us that since God is our Savior, when we are faced with difficulties, temptations, and challenges, our job is to simply walk in obedience to the Word of God. 21 Then Moses stretched out his hand over the sea. The Lord drove the sea ⌊back⌋ with a powerful east wind all that night and turned the sea into dry land. So the waters were divided, 22 and the Israelites went through the sea on dry ground, with the waters ⌊like⌋ a wall to them on their right and their left. Describe some steps of obedience that you need to take. 4. Never look back with fear. It was the LORD’s job to look upon the situation and defeat the enemy. It was not the Israelites job to look back upon the Egyptians to try to devise a plan to defeat them. For the Israelites, they needed to focus on the goal: walking one step at a time, crossing the Red Sea, trusting God to win this battle. I’m sure that with every step closer to the banks on the other side of the sea, each person’s heart was racing just a bit faster. But the adrenaline pumping didn’t cause them to have fear. And God amazingly defeated the Egyptian army by bringing the crushing walls of water of the Red Sea down upon them. Similarly, God will defeat your enemies (that attack your faith, your heart, your mind) as you walk in trust and obedience to Him. Do not be afraid (verse 13). Like the Israelites, when you finally do look back, you will see that God has defeated your spiritual enemies! 26 Then the Lord said to Moses, “Stretch out your hand over the sea so that the waters may come back on the Egyptians, on their chariots and horsemen.” 27 So Moses stretched out his hand over the sea, and at daybreak the sea returned to its normal depth. While the Egyptians were trying to escape from it, the Lord threw them into the sea. 28 The waters came back and covered the chariots and horsemen, the entire army of Pharaoh, that had gone after them into the sea. None of them survived. 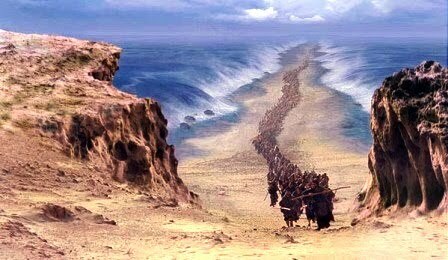 29 But the Israelites had walked through the sea on dry ground, with the waters ⌊like⌋ a wall to them on their right and their left. 30 That day the Lord saved Israel from the power of the Egyptians, and Israel saw the Egyptians dead on the seashore. What are some of your most difficult “enemies” to overcome? Why is it important to keep looking ahead, to not look back with fear? 5. Decide now to walk with the Lord at every opportunity. When God amazingly delivered the Israelites across the Red Sea, he saved their lives. Just like he delivered them out of slavery in Egypt (which represents how he delivers us from our sins), he also defeated their enemies at the Red Sea (which represents how he defeats our spiritual enemies, such as fear, temptation, bad habits, unbelief and much, much more). When the Israelites saw what God did to deliver them, they worshiped Him with a holy awe. This awe is represented by a holy fear of God. They were blown away by the way He saved them. And, they believed in Him. This type of belief led to faithful obedience and trust. In the same way, God desires that each spiritual victory we have should propel us to more and more faith, greater faithfulness, holy awe of God, and trust in Him. Victory today should lead to greater victories in the future. The nation of Israel didn’t completely follow this plan, but because of the death, burial and resurrection of Jesus Christ, and our trust in Him, we can!! How have spiritual victories in your life helped you to prepare for future spiritual battles? 31 When Israel saw the great power that the Lord used against the Egyptians, the people feared the Lord and believed in Him and in His servant Moses. See that God is bigger than the obstacle. Trust God for the ability to stand. Never look back in fear. Decide now to walk with the LORD at every opportunity.